Like the setting for the film "Call Me By Your Name," this romantic, versatile property offers endless visual inspiration. Built in 1923 by architect Kirtland Cutter, the historically restored villa blends Spanish and Italian architecture with its the walled courtyard, wrought iron balconies, stained wood casement windows with original brass latches, antique terra cotta tile roof, weathered stucco walls and four chimneys. A secret garden courtyard with wisteria, dogwood, and mossy flagstone paths creates a lush and enchanting environment. The bright and sunny period kitchen features plaster walls, 1920's square tile floors a sky blue French range with brass cross handles, a 51" double basin farm sink with brass gooseneck faucet. A lagoon-like geothermal swimming pool with its artistic rock bridge and island offers a captivating private oasis that extends the garden to encompass a full city residential block. 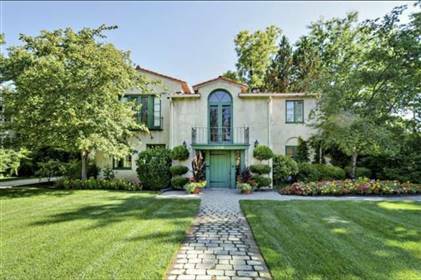 Situated on .57 acres, the Mediterranean home resides in an architecturally divine gridded residential historic district with Tudors, Victorians and Georgians, including an historic elementary school and quaint white church with a steeple. Today the property could serve as a convincing location for characters from the 1920's, 1930's, 1940's, 1950's, 1960's, 1970s or a modern family. It is perfect for a garden party, outdoor wedding scene, or Gatsby parties. The property with its cloistered garden spaces is situated in the serene Warm Springs neighborhood approximately .25 mi from the Boise River, .5 mile from Bronco Stadium with its blue turf. 1.5 miles from Boise's urban downtown core.